Though bluegrass is desirable for many lawns and pastures, it generally does not reach such status for alfalfa fields. According to Bruce Anderson, extension agronomist for the University of Nebraska, bluegrass is especially problematic in irrigated alfalfa where it lowers forage quality and may shorten alfalfa stand life. Bluegrass competes with alfalfa for moisture and regrows rapidly after the alfalfa field is cut, especially if moisture is available. High-density alfalfa stands are needed to compete with the bluegrass for sunlight, moisture and nutrients; but the key to thwarting a bluegrass invasion is to time irrigation so the top several inches of soil are dry at harvest. Then, suggests Anderson, keep the soil dry until several inches of alfalfa regrowth is initiated. Unlike alfalfa that has a deep root system, bluegrass is shallow rooted and won't compete well if soils are dry. Where thick alfalfa stands and correct water management practices exist, grass herbicides such as Select and Poast Plus may be used if bluegrass control still isn't adequate. Make applications immediately following a harvest. 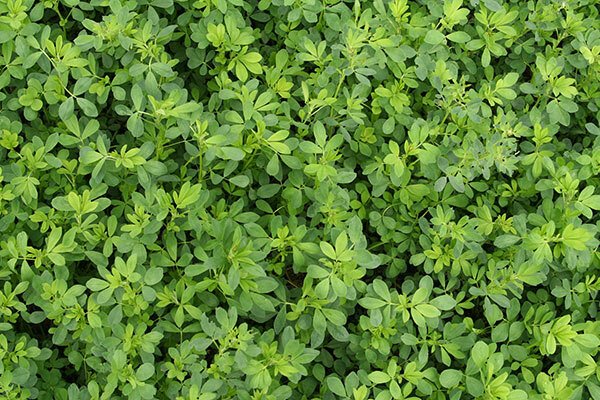 Glyphosate is also an option for Roundup Ready alfalfa varieties.